Sorry... the 2017 Nissan Titan is no longer being sold as new. Instead, take the first step to a great deal on 2019 Nissan Titan with a free price quote! 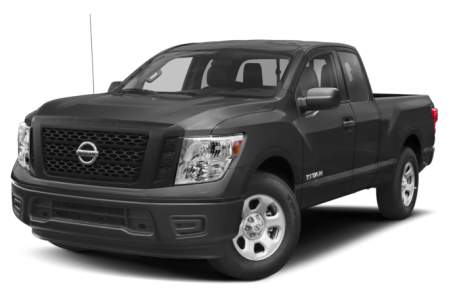 The 2017 Nissan Titan is an all-new, full-size pickup truck. It competes with the Ford F-150, Chevrolet Silverado 1500, and GMC Sierra 1500. Five trims are available: the S, SV, PRO-4X, SL, and Platinum Reserve. It comes with two configurations: Single Cab and Crew Cab. Although the Titan has a shorter wheelbase and a smaller rear cab than the Titan XD, it retains a similar appearance. It features the same broad, blockish front-end with a massive chrome grille. Various packages are also available for convenience, utility, towing, and comfort, which may include additional lighting, towing equipment, step-rails, sliding bed extender, power mirrors, all-season floor mats, and larger 18-inch or 20-inch wheels. All trim levels come with a center high mount stop light and 4-fixed tie-down hooks. The PRO-4X trim comes with all-terrain off-road tires, Bilstein shocks, and skid plates. The Platinum Reserve trim has a bulging, gray-tone underbody trim, which gives the truck a more rugged look. Under the hood, the Titan is powered by a standard 390-hp, 5.6-liter V-8 engine mated to a 7-speed automatic transmission that produces 394 pounds-feet of torque. Rear-wheel drive comes standard, while part-time 4-wheel drive is optional. Each trim level for the Titan has a distinguished interior, which can come in a variety of colors and finishes. Front seat configurations include bench-style (for 6-passengers total) or bucket-style. With a USB cable, smartphones can be connected to the dash mounted NissanConnect system for navigation and music. Other standard features include a 5-inch color display, Bluetooth hands-free phone system, streaming audio, air conditioning, dual zone automatic temperature control, cruise control, power windows/locks, and rear reading lamps. A larger 7-inch touchscreen, satellite radio, Rockford Fosgate audio system, and a DVD system are available as well. The Titan’s structure features zone body with front and rear crumple zones, body side reinforcements, hood buckling creases, knee bolsters, and a shift interlock system. The truck also has standard front air bags, passenger restraint systems, anti-lock brakes, vehicle dynamic control, traction control, and a tire pressure monitoring system. Rain-sensing automatic wipers, a blind spot warning system, and rear cross traffic alert are also available. 30 of 32 (93%) consumers said they would recommend this vehicle to a friend.